Search for your ticket on gopili to see the different companies for your train from Edinburgh (Eastern Scotland) to Barcelona (Spain). The services on board will change depending on the train provider. 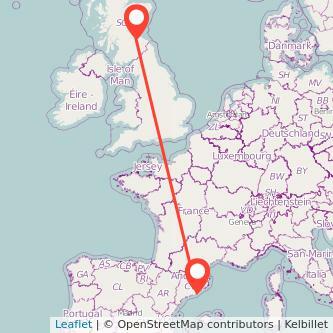 There are 1035 miles between both cities and the average train duration connecting Edinburgh to Barcelona is normally 2h16m. Travelling by train is normally the quickest solution to go to Barcelona from Edinburgh, and it's also more environmentally friendly than taking your car or using the plane. Based on our data, the lowest fare to travel in the next month is £149.00. This price is based on an adult ticket and does not include the money you can save with a railcard. Find the cheapest tickets to travel from Edinburgh to Barcelona by train, bus, ride sharing and plane. The table above is based on the best prices found over the last six months depending on how much time in advance the train is bought. Purchasing your train from Edinburgh to Barcelona in advance should enable you to spend less for your trip. We found tickets available from £242 when booking your ticket 2 months in advance which is 36% cheaper than the best ticket we found when buying your ticket on the day you're travelling. We compare train ticket for all major companies to travel between Edinburgh and Barcelona by train and find the best prices for the coming days. Take a look at the prices of train tickets Barcelona to Edinburgh and find the best deal for your outbound journey.